One of the best ways to add serenity and ceremony to your life is to light candles. Something so simple and basic... yet so emotionally satisfying. Aah, the power of fire. Just like water is a basic need. I believe that there is something very powerful about fire. Have you been camping lately? One of the rituals of camping is the campfire. Everyone sits around it and becomes mesmerized by it's beautiful glow. Stories start to be told. Sometimes spontaneous singing erupts. On occasion, games will break out. Campfires seem to bring out a sense of 'oneness' that would not happen otherwise. It's really a beautiful thing to participate in. In today's busy world, people have gotten away from the campfire. First of all, modern housing is not conducive to a fire pit. But if you have a fireplace, you may have experienced a bit of what I'm talking about. Fire has a transcending quality. It seems to take us to another place, a place where time seems slower, and hearts grow warmer. It's hard not to be drawn in by the power of fire. It's a completely natural force that definitely can have mood altering effects. For centuries, humans have been using fire to serve their purposes. Many religions use candles as a source of bringing fire into their ceremonial and worshiping rituals. Candles, which were created as a way of bringing fire into our lives, have turned out to be a wonderful invention. They make it so simple for us to bring fire anywhere, any time. In fact candles are so simple and readily available, many of us just forget about them and opt for their modern alternative...electrical lighting. By bringing candles into your life on a regular basis, you will notice a subtle difference that can give you a more peaceful existence. For many of us, it's not until the electrical power goes out completely that we reach for the candles. For some of us, candles mark a special occasion. Why not bring the 'special occasion' feel into our lives on a more regular basis? Taking a bath can be enhanced with the soft glow of candles. Enjoying your evening meal, relaxing after a long day, almost any time can be enhanced by the use of candlelight. Terra Cotta - You'll find lots of ideas for your candles at the local nursery. 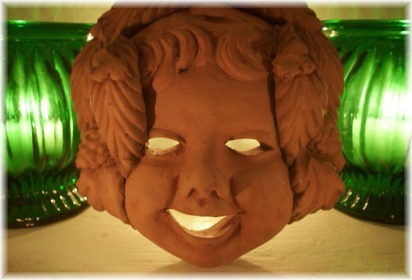 A garden cherub mask above makes for a perfect decoration to put in front of a candle. Terra cotta pots can be so simple and fun when they are set around at a garden party, or even in the house. Being fire safe makes them ideal for holding candles. 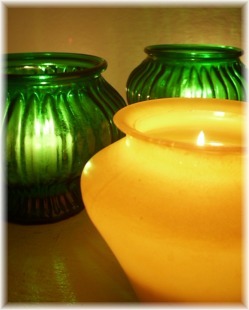 Colored Vases- Any candle can be made to look colorful with the right holder. Look around at flea markets and thrift stores for old colored vases. They were made with heavy glass to withstand the wear that went with the floral industry. 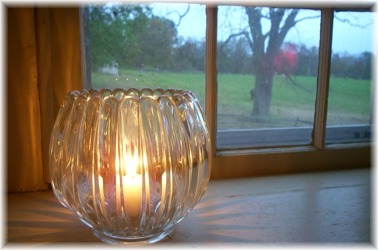 Today they are an inexpensive way to show off the radiance of your candle. See the two green vases above as an example. Glass lighting fixtures- Lighting fixtures are made of special tempered glass which makes them stronger than other glass. They are made to withstand more heat, making them ideal for holding candles. In one of the pictures above you will find an old yellow lighting fixture that creates a beautiful and elegant way to display the soft candleglow. 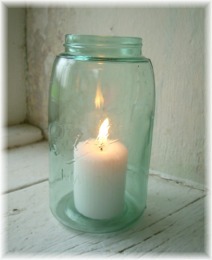 Mason jars- Whether old or new, Mason or jelly jars make whimsical holders for candles. Look for the old fashioned blue ones at flea markets, antique stores or thrift shops. They are usually inexpensive, and can be wonderful for setting on a picnic table for an informal gathering. Water- A very nice additive to your candle scene would be water. If you have a water fountain, you could add your candles in and around it. Of course you should make sure that they are secured. 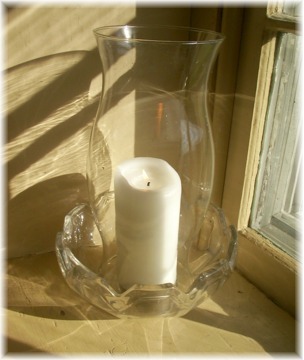 But the simplest way to add the element of water would be to fill up a pretty bowl that is lower than the candle. Or prop up the candle to be higher than the bowl. Leave as is, or add flowers, plants, plant clippings or any variety of fresh herbs or greenery around your candle. Make a tropical scene by adding seashells. You can even add a couple of drops of food coloring to your water for added effect. Of course there are floating candles available, and they are very nice if you want your candles to move with the water. 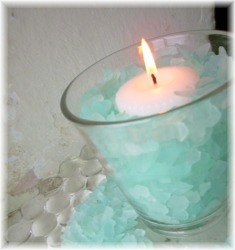 Sea Glass- Adding items that reflect the light and add color is a wonderful way to spice up the look of your candles. Sea glass are bits of actual glass that have been well worn by the ocean. Your local craft store would be a good place to look for sea glass in many different shades. Of course you should always be very careful when handling any type of glass. See an example of Sea glass below. Just remember to always be careful when dealing with fire. It demands your attention and respect. Never place anything that could catch on fire next to the candle. Never leave the room where a candle is burning. And be sure to watch out for the safety of children and pets when you have lit candles. The scent of your candles can be whatever you enjoy. There are many scented candles on the market. But a very nice way to have a more natural scent would be to add your own essential oils. Essential oils are the most volatile material that is contained in the plant cell. It is extracted through physical processes such as distillation or maceration. Essential oils are used as a form of 'aromatherapy', which is a subject that has grown in it's acceptance and appeal over the last few years. The more you know about it, the more options you will have to create the perfect scent for any occasion. Lavender is very pleasant and relaxing to most people. Marjoram is also a nice sweet yet subtle scent. Either Lemon or Sweet Orange can be very clean and refreshing. Either Peppermint or Rosemary will make nice 'wake-up' scents. Patchouli makes a good spicy, almost ceremonial fragrance. Eucalyptus or Tea Tree gives a nice clean feeling to any room. Cedarwood creates a deep musky aroma. Choose your scent according to the occasion as well as your mood. There is a lot to know about aromatherapy. I highly recommend getting a good book (or more) on the subject. The examples above are a good start. But that's all they are, just a start. Have fun, experiment with blends of a couple of scents together. But have a healthy respect for essential oils. Again, they are very potent and should never be used internally unless prescribed by a capable aromatherapist. Also, never apply directly to the skin. Always use a dropper, and clean the dropper in between use. Bring more coziness into your life... light a candle. Disclaimer - This article is not intended to replace medical advice or medical care. Any health or medical condition that you may have should be evaluated by your doctor or healthcare practitioner. The information in this article is strictly the opinion and belief of it's author. SharAmbrosia and the author of this article cannot be held responsible for any harm done to anyone that uses any information given here. The information in this article has not been evaluated by the FDA.